The article argues that Shakespeares language operates as much through rhythmic effects and resonances as through lexical meaning. Beginning with an example from the ritualistic language of Puck, it continues by referring to structural patterns in Elizabethan rhetoric, and then moves to discuss a parallel with formal structures in music. The advice provided by Thomas Morleys Plaine and Easie Introduction is fundamental, stressing the relation of patterns of movement to specific moods. Claims of the universality of rhythmic games are next assessed, before the discussion moves to the sub-lexical significance of language as therapy for people suffering from neurological disturbances, as explored in Oliver Sacks Musicophilia. Sacks concept of semantic aphasia, which allows rhythmic forms to take greater prominence, is then suggested as an approach to the force of many of Shakespeares most powerful passages. The value of such concepts in the plays in production is then examined, along with the idea of particular rhythmic qualities being specific to individual languages and groups of listeners. 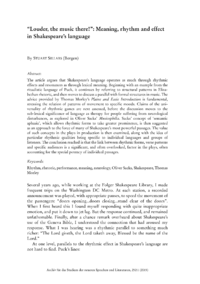 The conclusion reached is that the link between rhythmic forms, verse patterns and specific audiences is a significant, and often overlooked, factor in the plays, often accounting for the special potency of individual passages.